Jody Freeman is a member of our editorial team. Veteran war correspondent, Robert Fisk, speaking to a packed house at St. James United Church in Montréal in 2015, reflected on ISIS and the colonial history that has fomented justifiable resentment across much of the Middle East and continues to underlie ongoing conflicts. He pointed to the Sykes-Picot Agreement of 1916, in which the British and French colonial powers secretly agreed to divvy up much of the Middle East between them. One hundred years after the Sykes-Picot agreement, the dislocation of the world’s population has now reached unprecedented proportions, and we would be hard pressed to find a small pocket of humanity or nature left unscathed by the traumas of colonialism and the successive iterations of capitalism that have pushed our planet to the brink. On Friday, March 15, 2019, two events unfolded that have a bearing on our theme. One was the culmination of ever-broadening student strikes (#FridayforFuture) rallying young people around the world, calling for crisis intervention to save the planet. In Québec alone, more than 150,000 young people occupied the streets of Montréal and Québec City. [i] The other was the murder of 50 Muslim worshippers at the Noor mosque in Christchurch, New Zealand, by a young white Australian man driven by white supremacist ideology and hatred. That calculated massacre was perpetrated at the same time as young New Zealand students swelled the streets of Christchurch, marching to sustain life on earth. The new Coalition Avenir Québec (CAQ) government has just tabled its bill, An Act respecting the laicity of the State, which claims to be based on the following four principles: “the separation of State and religions, the religious neutrality of the State, the equality of all citizens, and freedom of conscience and freedom of religion.” To clinch the government’s own appearance of religious neutrality, the day before it tabled this legislation the CAQ government whipped its members into line to pass a resolution to remove the crucifix from the National Assembly (Québec’s parliament) – after a heated debate in which the vast majority of the party’s members argued to keep it as a part of Québec’s “heritage.”[iii] Doublespeak and double standards abound. Bill 21 prohibits public employees in teaching and various positions of authority from wearing “religious symbols.” While these symbols are not defined in the bill, the main targets are women who wear a hijab or other religious or traditional head coverings, and anyone wearing a kippah or turban. For the sake of appearance, conspicuous crosses aren’t considered kosher either, although tattoos of a cross would be allowed. It also bans anyone wearing a niqab, burka or other religious face covering from receiving or providing public services. To ward off legal challenges, given that freedom of conscience and freedom of religion are enshrined in the Québec Charter of Human Rights and Freedoms and the Canadian Charter, the CAQ government has chosen to override these sections of both charters, using their “notwithstanding” clauses. The CAQ didn’t even entertain the possibility of a more open, pluralistic model of secularism. [vii] It opted for the hardline version inspired by France, stamped with all the prejudices, fears and arrogance of a former colonial (and once Catholic) power that dominated and exploited much of North Africa not so long ago. And while the term laïcité is a concept rooted in the French revolution, its current application targeting religious Muslims, Sikhs, Hindus and Jews has nothing to do with Liberté, égalité, fraternité. In fact, the ugly debate in Québec that has been sowing division and fear for more than a decade is based not on any urgent problem that needs to be addressed – such as, say, the imminent takeover of government and schools by mullahs ready to impose Sharia law. It is based on fears of being overwhelmed by the Other, and of a weakening of the core values that have evolved in Québec. Twelve years ago, those fears drove the small town of Hérouxville in central Québec to adopt a code of values warning immigrants that “we” don’t stone or burn women here. [viii] The fact that there were no immigrants in Hérouxville only amplified the fear. Lack of familiarity can breed contempt. According to a number of specialists, the current charters of human rights and freedoms and the evolution of case law in Québec and Canada already guarantee the secularism (or laicity) of the State and public institutions, de facto and de jure (in fact and in case law). According to the Bouchard-Taylor Report, further measures could be applied to ensure greater neutrality of the State, such as by putting an end to implicit identification of the State with a religion. For example, by terminating the practice of saying an opening prayer before a municipal council session, removing the crucifix above the chair of the National Assembly, ending tax avoidance measures given to certain religious organizations, and cutting off public funding for confessional schools. 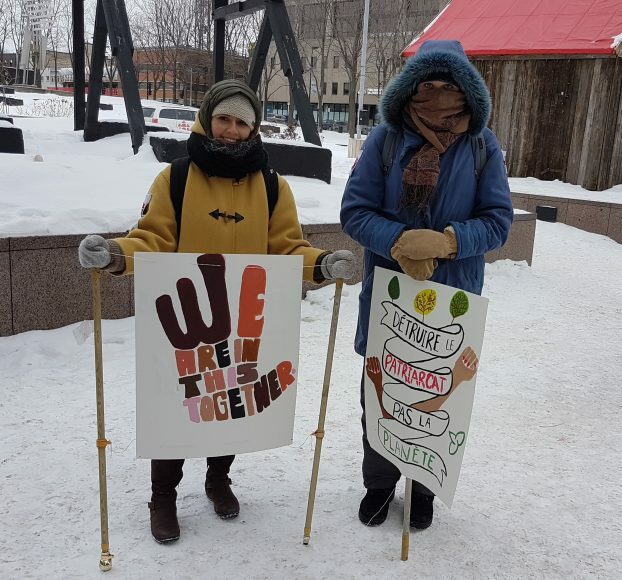 The disconnect between public rhetoric and action to ensure equality for women, the right to decent work and pay, and measures to end poverty and violence against women has long been evident, especially to Indigenous women and other women of colour. 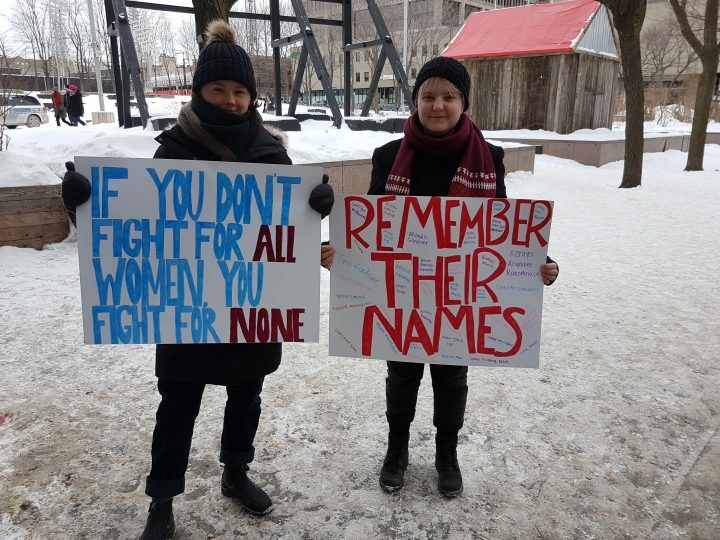 And with the volatile ingredients of faith, identity and culture thrown into the mix, the debates around secularism are ripping the veil off the paternalism underlying the attitudes of a number of Québec figures who claim to be fighting for equality. “Who is oppressed and who is the oppressor? In the eyes of Quebec’s new minister for the status of women, the answer appears to be black and white. Isabelle Charest said Tuesday that she sees the hijab as a sign of oppression. She ‘clarified’ Wednesday that her opinion extends to any religion that prescribes a dress code. “It sure doesn’t seem like Charest plans to do much for any of the women in Quebec who may soon find themselves ousted from their classrooms on the basis of how they dress. It’s up to us to step up and speak out, and there’s no time to lose. 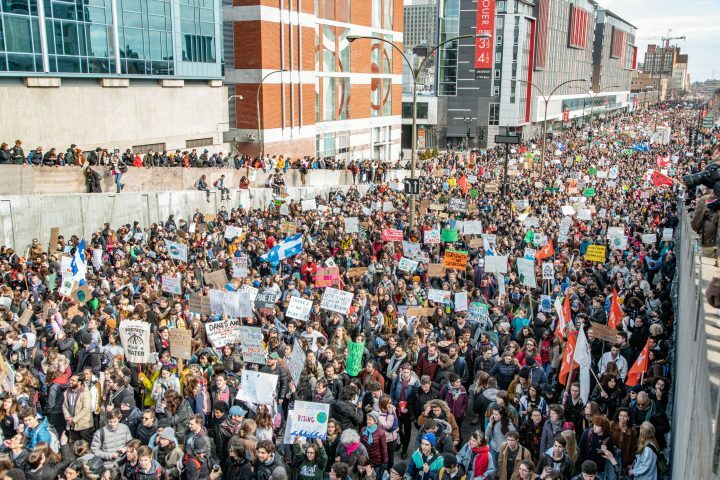 The students who are fighting for our planet are setting a new stage of their own making, hopefully one that will be based on genuine solidarity and mutual respect. Special thanks to Muriel Beaudet, Louise Dawson and Chantal Mantha for generously offering their copyediting skills in French. [vi] Idil Issa, “Opinion: CAQ government fosters exclusion and malaise,” Special to Montreal Gazette, originally published February 12, 2019. [vii] https://en.wikipedia.org/wiki/La%C3%AFcit%C3%A9; see also the Confédération des syndicats nationaux, « La Laïcité de l’État », p. 11. [ix] This section is drawn from the Confédération des syndicats nationaux’s document, « La Laïcité de l’État », p. 11, which cites the Bouchard-Taylor Report : Gérard Bouchard et Charles Taylor, Fonder l’avenir : le temps de la conciliation (version abrégée).